HAWAIIAN SHIRT Classic Happy Hour -= PAU HANA =- Aloha BIRD of PARADISE Vintage Repro Print Men's Size XL! The fabric is soooo luxurious and that gorgeous vintage style floral pattern, make this shirt so special! Perfect for Viva Las Vegas, Cruise Ship Vacation or Summer Party! Shirt: Shoulder seam to Shoulder seam across the top 21 1/2 inches, Underarm to Underarm/Chest 52 inches around, Waist 52 inches around and Overall Length is 32 inches from the top center back neckline to the hemline! **Condition** In LIKE NEW condition with no visible flaws to report! 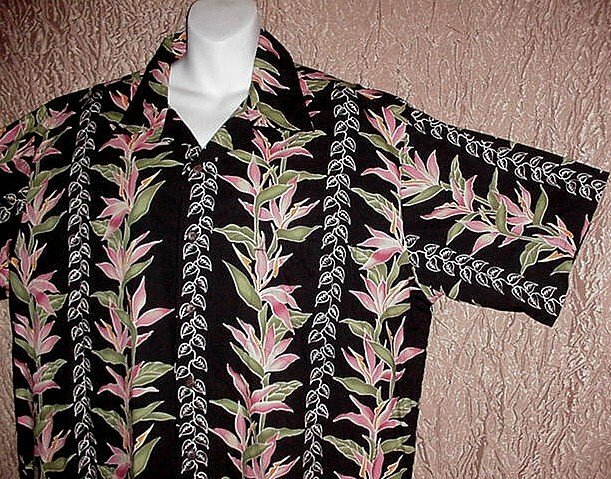 VINTAGE 60s HAWAIIAN SHIRT Tiki Vertical Borders HAWAII MADE w/FLORAL Print Men's SURFER Sz M! HAWAIIAN SHIRT Tropical -= BEACH at SUNSET =- Palms NATIVE Hula Girls Print BLAZING COLORS Sz L!